Mali came from goal down to beat Tunisia 2-1 in the quarter-finals of the African Nations Championship in Rwanda. Mohamed Ali Moncer (pictured) gave Tunisia the lead in the first-half. But a second-half penalty from Aliou Dieng and a goal with 10 minutes left to play from Abdoulaye Diarra sealed the win for Mali. The victory sets up a semi-final against neighbours Ivory Coast on Thursday. 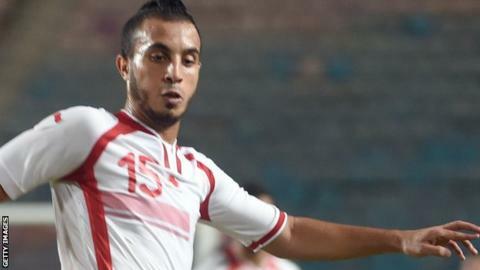 Moncer stooped to head home the opener for Tunisia after 14 minutes from a cross by Saad Bguir. Six minutes later Abdoul Toure came close to a Malian equaliser but Tunisian goalkeeper Rami Jeridi made the save. Tunisia had chances to extend their lead including a fierce shot from Ali Maaloul which was parried away by goalkeeper Diarra Djigui. After the break Tunisia seemed happy to try and soak up the pressure from Mali and hold on for the win. Mali got back into the game with 20 minutes left to play when they awarded a penalty after Zied Boughattas handled in the area, Dieng converted from the spot to level the scores. The winner for Mali came in the 80th minute when Diarra cut into the penalty area from the left wing and placed his low shot beyond Jeridi into the opposite corner. The final of the tournament for locally-based players only, will be in Kigali next Sunday.